It’s a gross way to start a blog post, I know. Forcing you to think about the dead skin cells you shed every day, some of which flake off and show up on your dark clothes (uck), some of which bond with the oil your skin produces and forms a gluey substance that sits on top of your epidermis, trapping dirt and oil, causing outbreaks (big time uchhh). Whatever. It’s a natural process, don’t get too grossed out. Exfoliation is an ancient practice. Our skin-obsessed predecessors crushed up just about everything, from nut shells and bark to marble and pumice stone, and used it all over their bodies to achieve glowing skin. Nowadays we have the option to use a physical exfoliant, or visit our dermatologist and pay for them to exfoliate our skin through chemical procedures, like microdermabrasion and chemical peels. More about those in another post. There are also a number of natural products on the market that can help break up that gunky layer through fruit acids, and the like, that work wonderfully. Those, also to be discussed in a future post. This post is about self-scrubbing – although I should probably use the term ‘gentle exfoliation’ so that no one causes damage to their delicate skin through scrubbing, which I worry suggests a rough and aggressive touch. There should be nothing vigorous happening to the skin on your face EVER, and any exfoliation should only take place after you’ve thoroughly washed your skin. I have to admit I was a bit apprehensive when first trying this clay (pictured in a beautiful brown glass jar on the left), since my skin is known to freak out from all sorts of things that are supposed to be wonderful, but I found that using it a few times a week, very gently, really helps to keep my skin feeling smooth and free of clogged pores. With ingredients like white and red clay, water-activated vitamin C, dalendula flower, cinnamon, nutmeg, clove, turmeric, and raw cacao, I knew that it would draw out impurities while encouraging intense blood flow, which is great for bringing life to skin tissue. CAVEAT: if you’re prone to rosacea of any type, this may not be the exfoliant for you. Not to worry, there are countless exfoliants on the market that are made for your sensitive skin, and as I’ve heard from many of my clients, facial manual exfoliation is simply not for everyone. Now, turning to body scrubbing. 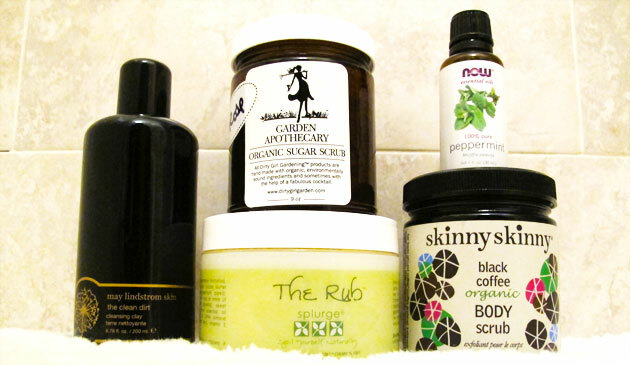 I’ve loved using a sugar and oil based body scrub since I was a kid. Garden Apothecary, the fantastic collection by LA-based, pro horticulturist, Jenn Segale (check out her site here: dirtygirlgarden.com), puts out the best rose body scrub I’ve ever used. The scent is unparalleled in that it smells just like the bits and pieces of rose you’ll find within, but it’s not too sweet, and has a bit of an earthiness to it that I’ve never smelled in a similar product. The scrubbing sugar particles are large and make for great thigh, upper arm, and if you can reach, back scrubbing. Plus I want to live near Jenn and learn horticulture from her. The next best thing: follow her blog, and use her products! I can’t wait to try the rest of her scrubs when I’m finished with this one. One side note: Jenn said she picks the roses from her garden by the ocean, in the moonlight, accompanied by her three chickens and two dogs. The thought of that makes me so happy. Pictured underneath the Garden Apothecary jar, sits a product sent to me by creators Christine and Kara, two school teachers who together created a small line of natural products and called it Splurge Skin Care. I’ve been loving using their peppermint scented-sugar scrub on my hands and feet for months now at the end of a long day. The granules of sugar are really fine and make for an easy, smooth massing-type of scrubbing. The oils and butters they use moisturize so well that I sometimes forget to lotion myself up afterwards! I have an almond scented one that I look forward to cracking open soon! There are many brands of peppermint oil on the market, and I can’t say I love one more than another. I found this one at my local health food store, but could easily be talked into trying another one. I know you’re wondering what I scrub with this, right? My hair is pretty dry most of the time and I generally don’t want to wash it, even with SLS -free shampoo’s, I really just want to condition it most days. I still want to make sure to keep that bad scalp smell at bay, so when my hairstylist friend, the super ingredient-savvy and all around really knowledgable hair guru, David Lopez, suggested that I try adding a few drops of peppermint oil to my handful of conditioner and then gently scrub my head with it, I couldn’t wait to try it. This trick works like a charm, although unless your hair is really dry, all the way to the scalp, you only need 2-4 drops – not 10, like I used the first time! Also note: if your eyes are sensitive, using more than 2-3 drops in the shower will likely make your eyes tear a bit. You know how I say I crave the smell of Artisana coconut oil in my morning oatmeal? I also crave the smell of this intensely fragrant coffee scrub in the morning. It really does wake me up. Plus the granules of sugar are coarse and give the skin on my body a nice reminder that it’s time to get the day started! The blend of coconut and jojoba oils leave my skin feeling delightful all day. What’s super cool is that the company is totally eco-friendly, based in Brooklyn, NY, and has an adorable and informative blog. They have a clementine and clove scent that I’m looking forward to enjoying, too. All of the above make great gifts for yourself, or a loved one. Scrub safely, everyone; the bottom of your tub or shower floor will get a little slick when you use an oil-based product. Please be careful!